POWER PRO PP-Q0 0 GAUGE & 4 GAUGE. 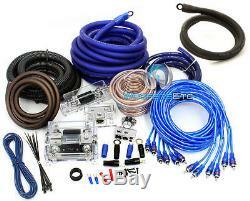 8500 WATTS 2-WAY 3 RCA WIRES AMPLIFIER INSTALLATION KIT. 17Ft 0 Gauge 15mm Blue Power Cable with 3/8 Ring Terminal. 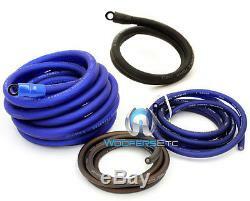 8Ft 4 Gauge 10mm Blue Power Cable. 3Ft 0 Gauge 15mm Black Ground Cable. 6Ft 4 Gauge 10mm Black Ground Cable. (3) 17Ft Clear Blue RCA Cables. 20Ft Blue Remote Turn-On Wire. (1) ANL Fuse Holder + 250 AMP ANL Fuse. 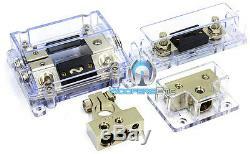 (1) ANL Fuse Power Distribution Block + 2 pcs 100 AMP ANL Fuse. (2) Bright Nickel Ring Terminals (2 Black). (4) Bright Nickel Spade Terminals (2 Blue/2 Black). (2) 18-22GA Spade Terminals (2 Blue). You will be issued a Return Authorization Number. In order to maintain an inventory of 100%, Brand New, A-Stock, untouched products, all sales are final. We ask that you please be sure you are ordering the correct product. The item "0 GAUGE & 4 GAUGE 2 WAY 8500W 3 RCA WIRE AMP KIT INSTALL DUAL AMPLIFIER CABLES O" is in sale since Friday, August 13, 2010. This item is in the category "Consumer Electronics\Vehicle Electronics & GPS\Car Audio & Video Installation\Amplifier Kits". The seller is "woofersetc_outlet" and is located in Los Angeles, California. This item can be shipped worldwide.